Inclusive: Aircon Van including Gas & Toll Fees, Boat Transpo, Camping Fees, Food for Lunch & Dinner. 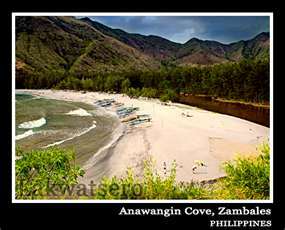 If your idea of a beach trip is chillin’ out by the beach in a hammock, singing around a campfire with a guitar and climbing beach cliffs to wait for the sunset then you should definitely go to Anawangin. Anawangin is a cove in the town of San Antonio in Zambales. It is a beach that has an off-white sand and an evergreen forest cover near the shore (you’ll rarely see a coconut tree in Anawangin). Behind the forest is a small stream that flows out to the sea (During summer this stream dries up into a shallow pond). 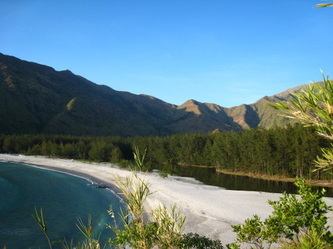 There are also two beach cliffs bounding the beach, which you can hike up and enjoy the view. Going to Anawangin will approximately take 6 hours. 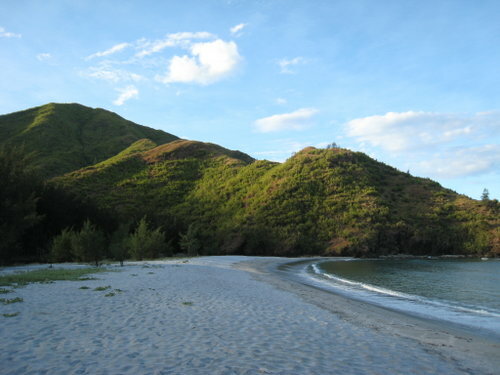 From Manila, you can drive or take a bus to San Antonio, Zambales. 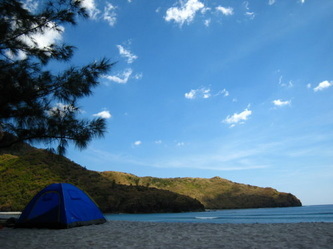 Upon arriving at San Antonio you can hire a boat at Pundaquit that will take you to Anawangin. It is advisable to leave Manila at night so it wouldn’t be hot while traveling. The best time to go would be around February when the weather is not too hot and humid, and there are not as many people camping. 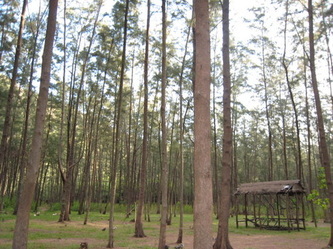 Though we like the hippie vibe during the Summer months of April and May, the campsite is just too crowded. There are no modern facilities in Anawangin; there are only a couple of toilets (without roofs) and water pumps as sources of running water. Bring lots of drinking water since drinking from the water pump is not safe, and the weather tends to be too hot at around 12 noon. Also bring your own food, there are no hotels and resorts that could prepare meals for you. For sleeping, you have to bring your own tent and pitch it under the forest cover where it is much cooler than by the shore. Gather fallen twigs and light up a fire for warmth during the night. Bring a guitar so you can sing around the campfire. Just don’t forget to put it out when going to sleep. The beach is bound by two cliffs in the north and south. The northern cliff is higher and is not adviseable to trek in since it has loose rocks. The southern cliff is gentler and is easier to climb. You can get a great view of the beach at sunset (just don’t forget to bring flashlights so you could see your way down). Behind the evergreen forest is a stream (a dry riverbed in the summer) leading to a large hill. You can trek your way to this hill, just be cautious since there were reports that there are wild animals in this area. You could bring your skimboard to practice your moves. The beach is great for this activity since it has a fine sand and few rocks. Have your group play with you or better yet, invite other campers to join your group for a great game of frisbee. You can arrange sidetrips with your boatman if you want to go island hopping. 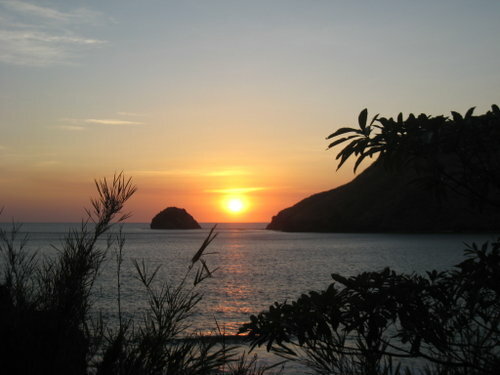 Nearby are Capones and Camara Islands. Capones Island is known for its centuries-old Spanish lighthouse while Camara Island is a rock climbing destination. Inform your boatman in advance and clear the details with him since there is no cellphone signal coverage in Anawangin. Same with travelling anywhere be cautious; the beach has strong undercurrent at times – there was a guy who almost drowned during our stay. There were also reports of wild animals in the forest so please watch out. With its evergreen forest, gentle stream, breath-taking views and off-white sand, Anawangin is one of the best beaches near Manila for city people who wouldn’t mind roughing it out in the great outdoors.